Who knew that a simple invitation to participate in a lunchtime game of Ultimate Frisbee would change my life, allow me to travel the world, forge lifelong friendships, and fire my ambition to go for the gold. 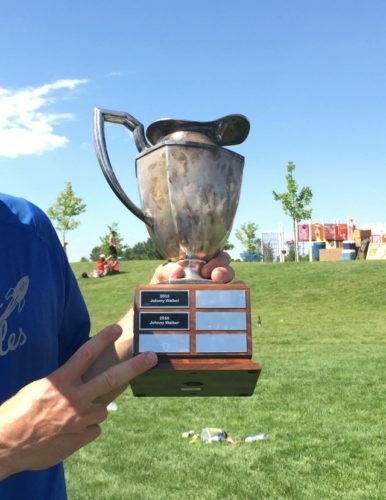 Ultimate Frisbee, long known to the public as a grassroots activity of the hippy culture, is largely responsible for fueling the accomplishments in my personal and business life. Unlike most other traditional sports, it is a self-refereed game. This self-refereed aspect is known as the The Spirit of the Game, or SOTG. All fouls and violations are called by the players on the field. When a foul is noted, both parties have to agree on a fair outcome- Can you imagine Kobe or LeBron calling fouls, or Aaron Rodgers or someone like JR Smith or James Harden trying to fairly self ref a game? What a mess that would be! This one ingredient of the game is THE singular most important characteristic distinguishing Ultimate Frisbee from every other sport. 1). You agree with the defender that the frisbee did hit the ground first, which results in a turnover, and now you are on defense. 2). The defender agrees that you caught the frisbee cleanly and you now have won the game. 3). You both agree that you can’t agree if the frisbee was up or down and a repeat/do-over is warranted. It’s this talking point in creating a fair and appropriate outcome that differentiates Ultimate Frisbee from every other sport. As this sport is being played by every age group, the benefits of learning the game with the SOTG as the underlying framework, creates life long benefits outside the field of play. *As a note, the youth/adult program in Portland is incredible and information about it can be found at Portlandultimate.org. As a teenager who grew up playing all of the traditional sports, I was introduced to the game of Ultimate Frisbee in 1988 by my summertime employer, Mr Doug Voderberg. He was one of the captains and a player on the local Portland elite men’s team, Portland Rhino. During a phone interview with him about an upcoming job, Doug requested that I bring work boots, a gallon of water, and cleats to the job site. What did I need cleats for? At lunchtime we proceeded to Willamette Park. There I saw a game of soccer being played on one field and people throwing a frisbee on another field. Doug jumped out of his truck, grabbed his old red canvas duffle bag and headed in the direction of the people playing a silly looking game of frisbee. Not only was I disappointed not to be playing soccer, but, I was also a bit bummed at the thought of playing some silly game of frisbee when I could be eating my lunch. Why would I give up my lunch to play frisbee anyway? Well we played frisbee that day. At least I tried and my life was changed forever. I enrolled at OSU, co-captained the Ultimate team from 1991-1996, and developed some incredible friendships that are today some of my most cherished relationships. 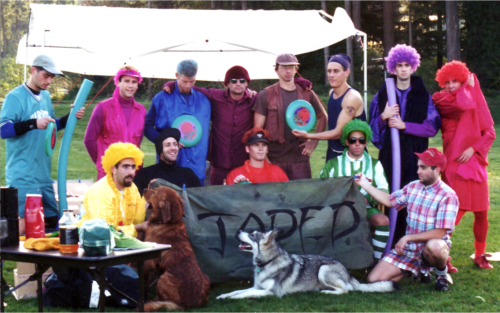 After graduation a group of my best Ultimate friends from OSU and UO created a team called Jaded Andain. This team defined what Ultimate Frisbee meant to me. We were a super fun team of young 20 year olds, fast, athletic and full of “know it all”. Though we never won a tournament, we sure acted like we did! 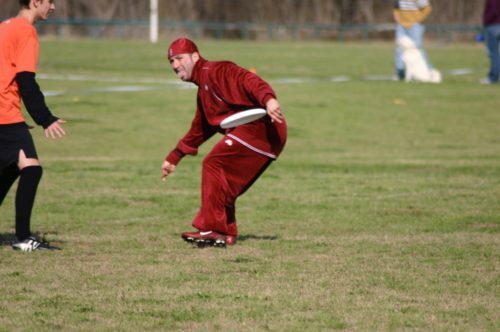 From 1998 through 2007, I played frisbee with the Portland Men’s team. Throughout our years, we would play just be well enough to finish consistently within the top 10 at Nationals and at Worlds. It wasn’t until I began playing with teams outside of Oregon that I was able to experience winning National and World Championships. 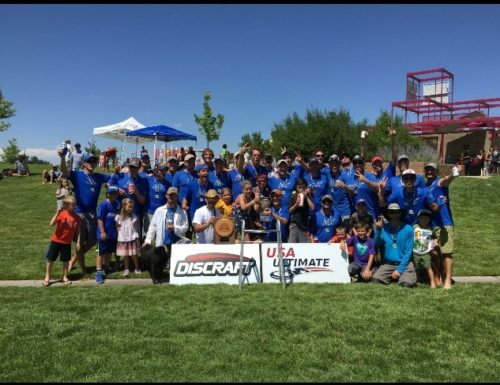 In 2009, a handful of Portland men joined forces with a San Francisco crew to win UPA Nationals, which qualified us for Worlds 2010 in Prague. We competed against teams from around the globe and our US team won The Gold Medal in 2010. 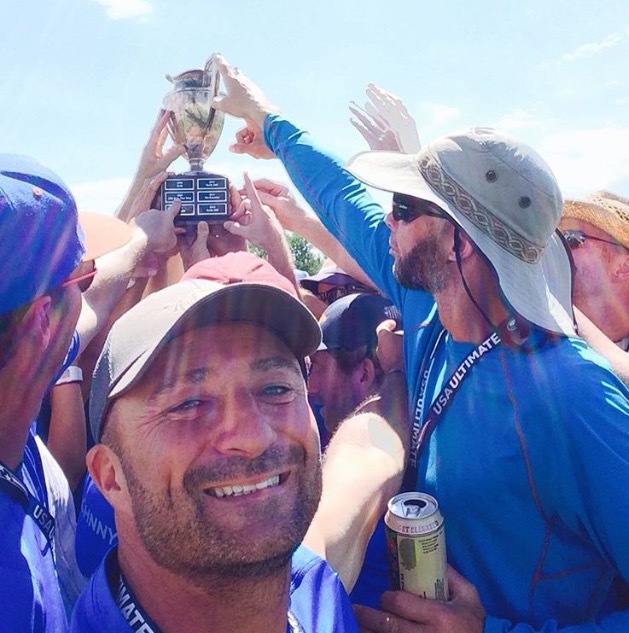 In 2014 we joined a Colorado contingent and won the Bronze Medal at Worlds in Italy. The following year we won Gold at the 2015 USAU Nationals and repeated our victory winning the Gold at 2016 USAU National Championships. The game of frisbee brings important life ingredients to the field of play. In return, it has taught me life lessons off the field that have helped craft my amazing life. If you are interested in learning more about Ultimate Frisbee, please take a look at the PUFF website(Portland ultimate.org) or contact me directly.